Just about everyone is in love with the iPhone already, but it does admittedly have some limitations. These add-on devices from Ion Audio were spotted at CES 2010 and they’re designed to add a little something special to the iPhone. 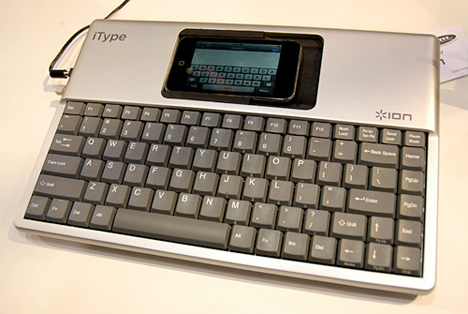 The iType is a physical keyboard that you snap your iPhone right into. Anyone who has ever struggled with the teeny-tiny touch keypad will appreciate just how handy this will probably be. But don’t rejoice just yet – because of the proprietary nature of most iPhone apps, you can’t type in any old app; you have to type in the iType app and then copy and paste into whatever app you want the text to appear in. A nuisance, maybe, but it’s a small price to pay for being able to actually type on a real keyboard. One of the coolest, if slightly over-hyped, features of the iPhone is its ability to create music. 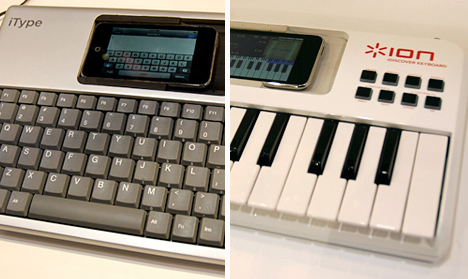 Instrument simulation apps abound, including several that let you pretend that your iPhone is a keyboard. 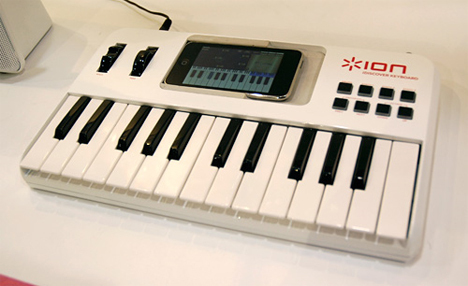 But Ion lets you play a physical keyboard with the iDiscover Keyboard and associated iDiscover Keyboard app. As if that wasn’t awesome enough, the setup lets you use your iPhone as a mini music studio, and it can be used as a MIDI controller for Macs or PCs. See more in Various Gizmos or under Gadgets. January, 2010.